You’ve heard us talk a lot about the benefits of Seattle rain gardens. In the coming months, you’ll hear a lot more about rain gardens in West Seattle, as King County embarks on a bold project to control stormwater overflows by using so-called green infrastructure such as rain gardens, plantings, trees and other vegetative areas. 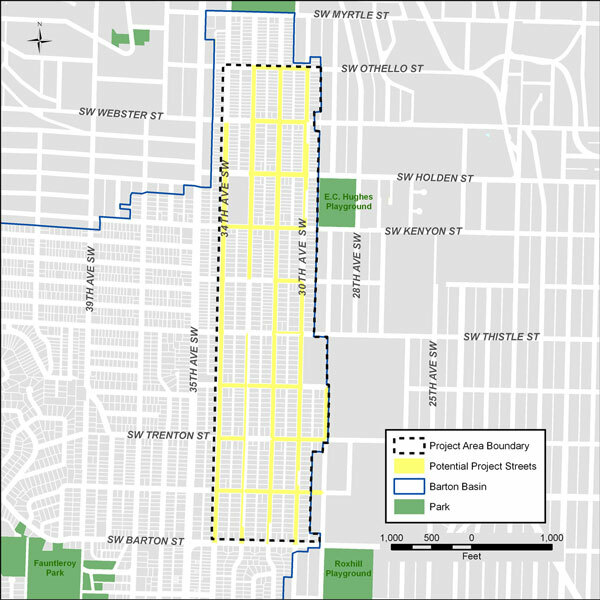 In December 2010, the county recommended a stormwater control project for the Barton basin that calls for rain gardens between sidewalks and curbs in a 66-block area in the Sunrise Heights and Westwood neighborhoods in West Seattle. Rain gardens use the natural properties of vegetation and soil to help soak up excess stormwater runoff that would otherwise end up in Puget Sound. The Green Stormwater Infrastructure project is the first such “green” project for the King County Wastewater Treatment Division, which is responsible for wastewater treatment for Seattle and 16 other cities. The goal of the project is to reduce overflows from the Barton Pump Station near Seattle’s Lincoln Park. During times of heavy rains, pipes that carry both stormwater and wastewater get overwhelmed. Instead of sending water to the wastewater treatment plant, untreated water flows directly into Puget Sound near Lincoln Park. The county says this happens about four times a year. 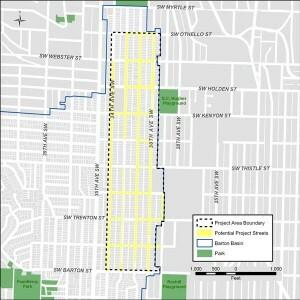 In public meetings, many West Seattle residents told the county planners that they wanted a green solution to the problem of combined sewer overflows. The county is beginning its environmental project review in coming months, and says construction is expected to begin no later than December 2013 and take two years.